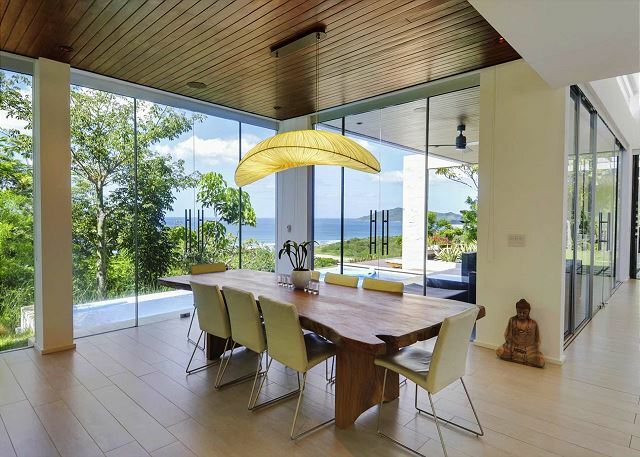 Casa Lomas del Mar is a sleek, modern 4-Bed/4-Bath villa with brand new furnishings and a breathtaking panoramic view. 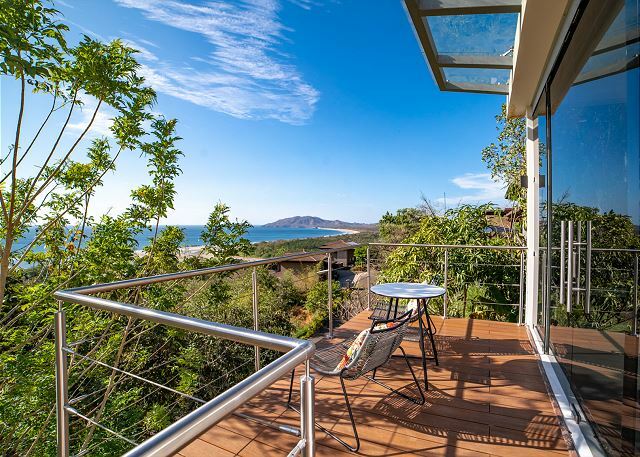 This hillside paradise is located in an exclusive gated community that sits above the northern end of Tamarindo beach and overlooks the vast expanse of Playa Grande and Las Baulas National Marine Park. 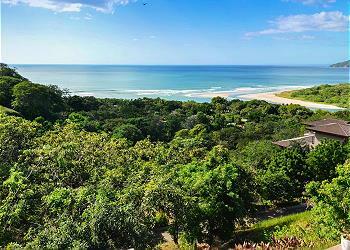 On the beach in front of Casa Lomas del Mar are the waves that make Tamarindo an international surf destination. The minimalistic design of this exclusive home utilizes angles and sharp lines that perfectly balance with the smooth curves of the hills against the horizon. Floor-to ceiling glass that divides the interior and exterior living spaces on the north and west sides of the villa creates a feeling of uninterrupted space, and of harmony with the surrounding jungle and sky. 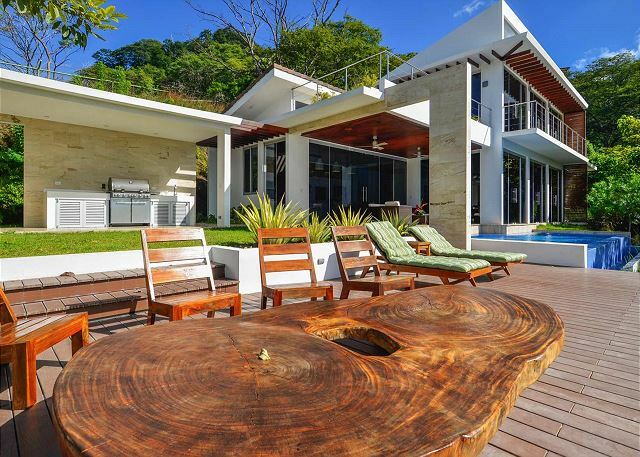 An infinity edge pool, a sun deck built from local wood, an outdoor sitting room, and a barbeque patio delight guests at Casa las Lomas with the best in outdoor luxury living. 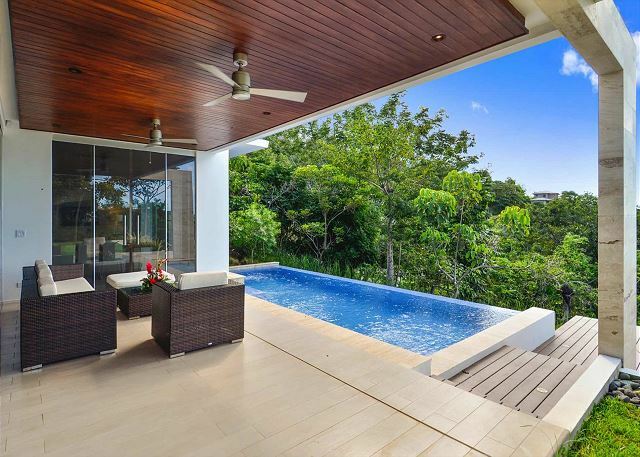 Inside, this magnificent villa offers 3,200 sq. ft. of luxurious space on two levels. 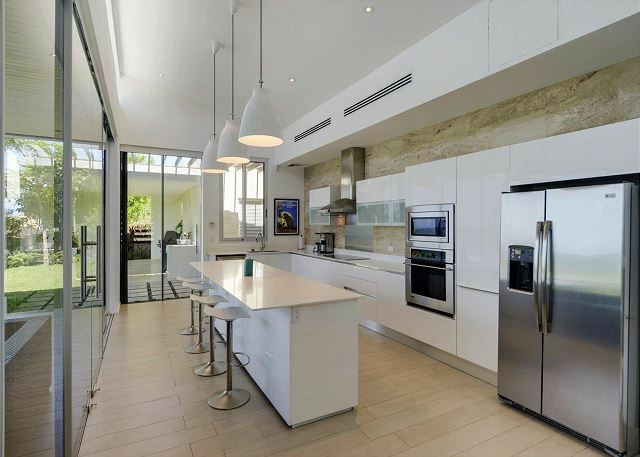 On the first level, a spacious modern-design kitchen includes everything you or your private chef needs to prepare and serve full-course gourmet meals. 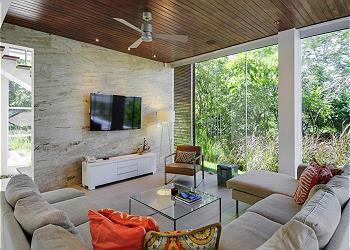 One single, airy common room encompasses the living and dining area, with its riveting 180 degree panorama. There are 3 bed/bath suites in the main house and a fourth bed/bath suite located is a separate Casita. Two of the home’s four bed/bath suites are on this first level. The second level of Casa Lomas del Mar is dedicated exclusively to the master suite. This spacious luxury suite feels as if it were suspended in the sky. 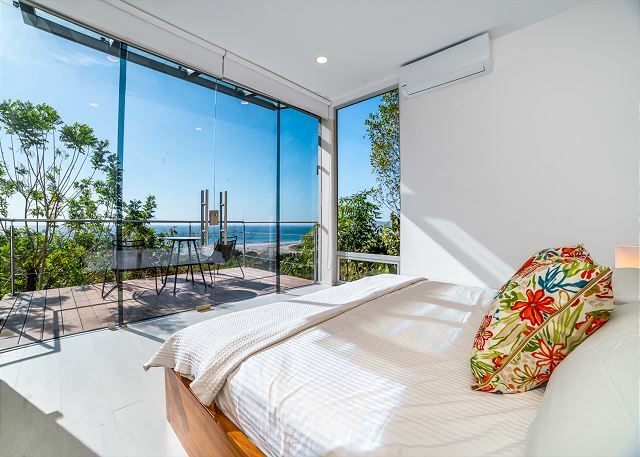 Floor to ceiling glass on two sides, with black-out blinds for sleeping, floods the room with natural light and paints a constantly-changing seascape framed by jungle foliage. 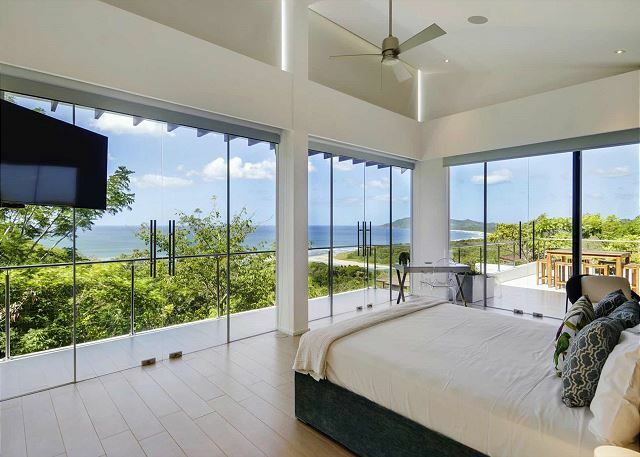 Private patios and rooftop terraces accessible only through the master bedroom offer peaceful places for quiet moments of contemplation. 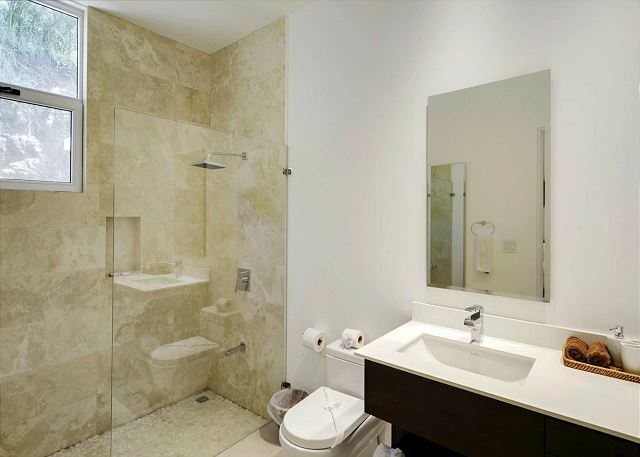 The Fourth bedroom/bathroom suite is a Casita separate from the main house. The Casita includes a bath with shower, King Bed and amenities such as a small fridge, coffee maker, electric kettle, toaster, glass ware, coffee cups, cutlery and dishes. 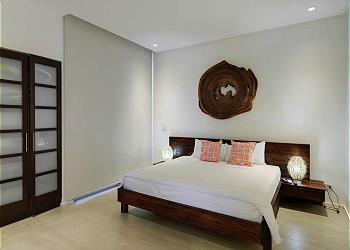 Casa Lomas del Mar is fully air conditioned and is equipped with cable television and high-speed wi-fi internet access. 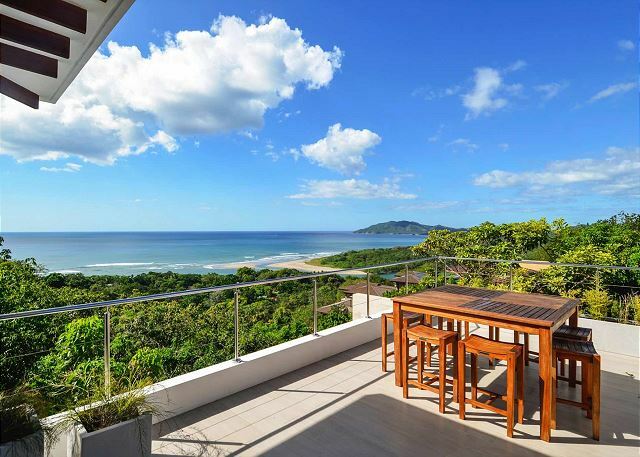 It’s easy proximity to Tamarindo beach make this vacation villa an excellent choice for surfers, families, and intimate groups of friends. 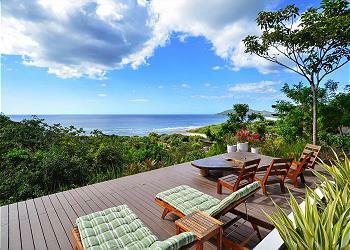 We stayed for 6 days at Casa Lomas del Mar and every aspect of the experience was outstanding. I cannot thank Kate enough for her help during the booking process, and Cris and Adriana for making sure we got there and had everything we needed. The house really was amazing and we spent a majority of our time outside by the pool. I would definitely have them arrange transportation from the airport and would also get a golf cart for exploring Tamarindo. The beach is at the bottom of the hill and the sunsets are unbelievable. There are lots of places to eat in town - we really enjoyed Dragonfly. Don't hesitate - just go! We got wedding ready at Casa Lomas del Mar! We stayed at Casa Lomas del Mar the weekend of our wedding, and it was the most beautiful setting for such a memorable weekend. The house was clean, wonderfully decorated, and the staff was very available. We would most definitely come back! We had the best time! Very enjoyable. Clean property. All staff, from office to housekeeping to grounds were friendly and accommodating. We do recommend a new bed mattress! Casa Lomas del Mar was amazing! We recently stayed 7 nights and couldn't have asked for a better location(the view was breathtaking). The house was beautiful and stocked with everything you need. Cris and Adriana were so helpful and made everything so easy! We will definitely be back!!! The house was AMAZING! 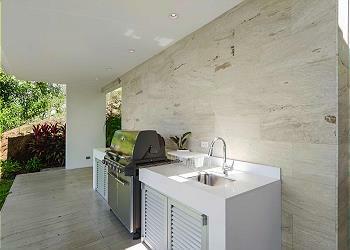 Set in a very idealic and gorgeous area. The house was super clean and incredibly functional. The AC was amazing too, haha. I have zero complaints about the functionality and beauty of the house. The staff was super friendly and helpful during the booking process and even leading up to the day we arrived. Thank you Tim! We are thrilled to hear you had an amazing time during your stay in Casa Lomas del Mar and found it beautiful and comfortable. It was our pleasure to assist you before and during your stay and we hope you will make Casa Lomas del Mar a repeat destination. Pura Vida! what an amazing home the pictures don't do the view justice. we enjoyed watching the sunset each night on the deck and could not ask for a more perfect view. Adriana was so helpful and put our trip over the top with helpful hints and recommendations during our stay in Tamarindo. We definitely will return! Jeffrey, We're thrilled to know everything went great with your trip and you enjoyed so much the beautiful view and sunsets from the house. It was our pleasure assisting you during your vacation and we look forward to welcoming you back for another round very soon! Most of the time when you arrive at a rental, you'll find that the photos are a bit embellished but this was definitely not the case. The house was exactly as pictured and might even be more spectacular in person. The house was spotless when we arrived and the views from the pool and upstairs suite were unbelievable! The hill leading up to the house is walkable but I would highly recommend renting a car or golf cart for a more enjoyable vacation. The guard at the gate also made it very safe and provided us comfort when in the house. The staff was great as well. Communications with Lucas and Cristina before the trip was very easy and they were both very prompt with their responses. Check in with Gilda was quick and simple. Cristina was available to help us with activities, cart rental and massage appointments as needed. Then there was Johnny, we can't say enough about Johnny, he was beyond amazing. He picked us up from the airport and took us to the market on the day we arrived to get groceries and gave us tidbits about the town. On the day of our tour he took us to get breakfast before starting the day. During the tour he took photos and videos for us. He even went on the zip line with us just to take photos and videos for us. He definitely went above and beyond to make our experience a great one. We were unable to carry phones and cameras with us during the activities so we were extremely glad that Johnny was there to capture the moments for us on his phone. He sent them to us later that evening and he took a lot of photos and vids too because we received a total of 64 emails from him! On the way back he took us groceries shopping again per our request. Basically everything we asked of him, he did for us and at times even went above and beyond. He definitely made it a lot easier to enjoy our time in Costa Rica. But overall, the whole staff was great, Lucas, Cristina, Gilda and Johnny, everyone was wonderful. Casa Llomas del Mar: we coundn't end up in a lovelier place! Casa Llomas was paradise on earth. 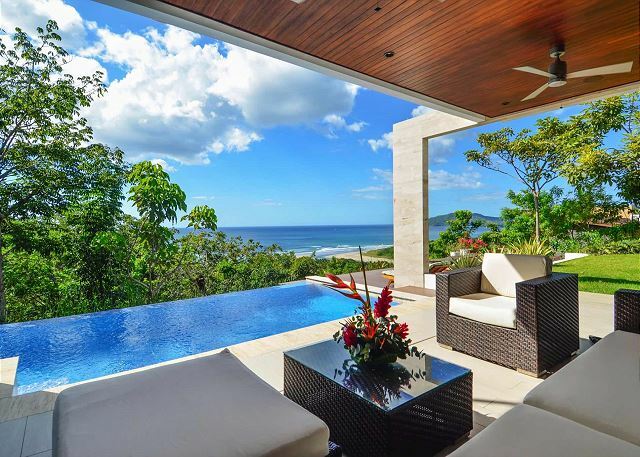 The view was stunning, the interior design was breathtaking, the location perfect( maybe because we had a car and had no problem with the very steep road to reach the house).The property was clean, very well maintained and everything worked. The staff was kind and smiling, although I found it more relaxed than professional.When we arrived they handed up the keys and said goodbye. We had to insist to be at least taken to the house since we had no idea of the community layout; the lady who took us knew nothing of the property and left us to figure out how everything worked. We did our best but on the second day had to ask for help with a few amenities. When we left we asked if anyone wanted to inspect the property for damage, but we were told there was no need and we could just leave the key by the office. Now that I think of it, it was rather pleasant to find such a laidback service, but at the time it seemed rather odd. There is just one thing we did not apprecciate: we were told, upon my specific request,that there was not going to be any construction site nearby. But there was. Pity. Apart from that small disappointment, I would higly recommend Casa Llomas to anyone who has a car. Thank you Francesca, we're thrilled to know you loved Casa Lomas and enjoyed your stay! We consider ourselves both professional & laid back, we believe in embracing the meaning of "pura vida", we like to work hard and provide our guests with great quality experiences and at the same time have a more laid back office environment, which allows us to be ourselves, enjoy our work more and therefore provide with excellent customer service. Thank you again for staying with us, we hope to have you back soon! Pura vida!